So, it’s here, Windows 8, what the company is calling “a new era of PCs” and what is undoubtedly the biggest shakeup to hit your desktop or laptop PC in the past decade. In many ways, Windows 8 represents a bold break from predecessors such as Windows 7 and Windows Vista, most clearly seen in the new tiled start screen that seems to be so terrifying to some users. Generally, though, the mechanics of Windows 8 are fairly similar to previous Windows and general users should find themselves at home on the system fairly quickly. So, first up, that start screen, the array of tiles that has prompted some users to accuse Microsoft of trying to switch everyone to a tablet by imposing a tablet-style OS onto a platform it is simply unsuited to, the desktop or laptop PC. Again though, behind the hyperbole, and once you get over the shock of the new, it seems like a fairly sensible decision, allowing you to group your programs under categories like multimedia and games, and then scroll horizontally through those categories. Fair enough, it is different, but would that many users really prefer to clutter their desktop with a multitude of unordered shortcuts or scroll through all programs in the start bar. 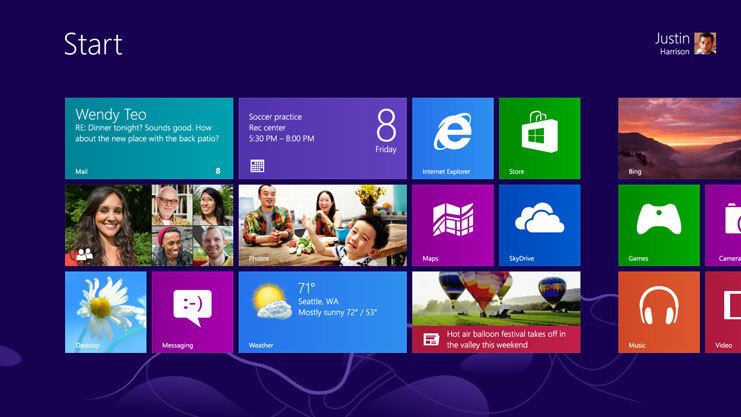 Notably, Windows 8 also allows you to install apps on your desktop or laptop computer, which, once installed, are accessed through the start screen and then open full screen. The potential for this is obviously exciting, opening a world of inexpensive games and intuitive experiences to a new audience, although it remains to be seen how well apps designed for touchscreens will translate to non-touch devices. These apps are found in the Windows store, which is again accessed through the start screen. Clicking desktop on the smart screen takes you to a desktop very much like the one you know from your current version of Windows, with one key difference, the absence of a start button in the bottom left-hand corner (i.e. the button with a windows logo on). It is this that the new smart screen has replaced, but Windows have done their best to make this as intuitive as they can. button is exactly where it used to be, it’s just invisible. Really though, aside from the start screen, not that much has changed in Windows 8, right clicking on the screen will still give you additional options just the way it used to and files can still be dragged and dropped on the desktop screen. Windows Explorer is slightly different, offering a ribbon that will be familiar to any user of Word 2010 onwards that gives you easy access to options like copy, rename and delete. Admittedly, Internet Explorer seems to have been changed fairly significantly, with users needing to drag down from the top of the screen to access tabs for example, but as all the other major browsers work with Windows 8, this is unlikely to be a change that will significantly affect most users. So, while Windows 8 may at first seem like a radical departure from previous versions of Windows, the system is still running on the same basic rules and this is therefore only another evolution, albeit the most significant one that Microsoft has implemented in decades. Really though, after five minutes of getting to grips with Windows 8’s quirks and foibles, the new OS will quickly become second nature and users will be left to enjoy a fresh, new, clean Windows.